NOTE: The instructions to setup a StarlingX All-in-One Duplex (AIO-DX) with containerized openstack services in this guide are under development. For approved instructions, see the All in One Duplex Configuration wiki page. Consolidate legacy applications that must run standalone on a server by using multiple virtual machines. Consolidate legacy applications that run on different operating systems or different distributions of operating systems by using multiple virtual machines. High availability services running on the controller function across the two physical servers in either active/active or active/standby mode. Storage function running on top of LVM on single second disk, DRBD-sync’d between the servers. Virtual machines being scheduled on both compute functions. All controller high availability services go active on remaining healthy server. All virtual machines are recovered on remaining healthy server. Small amount of cloud processing/storage. Protection against overall server hardware fault. The All-In-One Duplex Extended deployment option extends the capacity of the All-In-One Duplex deployment by adding up to four compute nodes to the deployment. The extended deployment option provides a capacity growth path for someone starting with an All-In-One Duplex deployment. With this option, virtual machines can be scheduled on either of the all-in-one controller nodes and/or the compute nodes. This configuration is limited to four compute nodes as the controller function on the all-in-one controllers has only a portion of the processing power of the overall server. NOTE: The All-In-One Duplex configuration requires one or more data ports. The XML for virtual servers in stx-tools repo, deployment/libvirt, provides both graphical and text consoles. Access the graphical console in virt-manager by right-click on the domain (the server) and selecting “Open”. Access the textual console with the command “virsh console $DOMAIN”, where DOMAIN is the name of the server shown in virsh. When booting the controller-0 for the first time, both the serial and graphical consoles will present the initial configuration menu for the cluster. One can select serial or graphical console for controller-0. For the other nodes however only serial is used, regardless of which option is selected. Open the graphic console on all servers before powering them on to observe the boot device selection and PXI boot progress. Run “virsh console $DOMAIN” command promptly after power on to see the initial boot sequence which follows the boot device selection. One has a few seconds to do this. Installing controller-0 involves initializing a host with software and then applying a bootstrap configuration from the command line. The configured bootstrapped host becomes controller-0. Power on the server that will be controller-0 with the StarlingX ISO on a USB in a bootable USB slot. Configure the controller using the config_controller script. This section describes how to initialize StarlingX in host controller-0. Except where noted, all the commands must be executed from a console of the host. When the installer is loaded and the installer welcome screen appears in the controller-0 host, select the type of installation “All-in-one Controller Configuration”. Select the “Graphical Console” as the console to use during installation. Select “Standard Security Boot Profile” as the security profile. Monitor the initialization. When it is complete, a reboot is initiated on the controller-0 host, briefly displays a GNU GRUB screen, and then boots automatically into the StarlingX image. controller-0 is initialized with StarlingX, and is ready for configuration. This section describes how to perform the controller-0 configuration interactively just to bootstrap system with minimum critical data. Except where noted, all the commands must be executed from the console of the active controller (here assumed to be controller-0). For the virtual environment, you can accept all the default values immediately after ‘system date and time’. For a physical deployment, answer the bootstrap configuration questions with answers applicable to your particular physical setup. Please complete any out of service commissioning steps with system commands and unlock controller to proceed. After config_controller bootstrap configuration, REST API, CLI and Horizon interfaces are enabled on the controller-0 OAM IP address. The remaining installation instructions will use the CLI. | uuid                                 | name    | class    |...| vlan | ports        | uses | used by | attributes |..
|                                      |         |          |...| id   |              | i/f  | i/f     |            |..
| 49fd8938-e76f-49f1-879e-83c431a9f1af | enp0s3  | platform |...| None | [u'enp0s3']  |    |       | MTU=1500   |..
| 8957bb2c-fec3-4e5d-b4ed-78071f9f781c | eth1000 | None     |...| None | [u'eth1000'] |    |       | MTU=1500   |..
| bf6f4cad-1022-4dd7-962b-4d7c47d16d54 | eth1001 | None     |...| None | [u'eth1001'] |    |       | MTU=1500   |..
| f59b9469-7702-4b46-bad5-683b95f0a1cb | enp0s8  | platform |...| None | [u'enp0s8']  |    |       | MTU=1500   |.. WARNING : THIS OPERATION IS NOT REVERSIBLE AND CANNOT BE CANCELLED. By confirming this operation, the LVM backend will be created. Please follow the administrator guide to complete configuring the system. The host is rebooted. During the reboot, the command line is unavailable, and any ssh connections are dropped. To monitor the progress of the reboot, use the controller-0 console. After initializing and configuring controller-0, you can add and configure a backup controller controller-1. Waiting for this node to be configured. controller node in order to proceed. On controller-0, you can monitor the installation progress by running the system host-show command for the host periodically. Progress is shown in the install_state field. Wait while the controller-1 is configured and rebooted. Up to 20 minutes may be required for a reboot, depending on hardware. When the reboot is complete, the controller-1 is reported as locked, disabled, and online. | uuid                                 | name    | network |...| vlan | ports        | uses | used | attributes |..
|                                      |         | type    |...| id   |              | i/f  | by   |            |..
|                                      |         |         |...|      |              |      | i/f  |            |..
| 160bfede-0950-42ba-acef-d0eb31e7fc49 | ens6    | oam     |...| None | [u'enp0s3']  |    |    | MTU=1500   |..
| 37b3abcd-bcbe-44d5-b2fb-759c34efec89 | eth1001 | None    |...| None | [u'eth1001'] |    |    | MTU=1500   |..
| 81d66feb-b23c-4533-bd4b-129f9b75ecd6 | mgmt0   | mgmt    |...| None | [u'enp0s8']  |    |    | MTU=1500   |..
| e78ad9a9-e74d-4c6c-9de8-0e41aad8d7b7 | eth1000 | None    |...| None | [u'eth1000'] |    |    | MTU=1500   |.. Wait while the controller-1 is rebooted. Up to 10 minutes may be required for a reboot, depending on hardware. REMARK: controller-1 will remain in degraded state until data-syncing is complete. The duration is dependant on the virtualization host’s configuration - i.e., the number and configuration of physical disks used to host the nodes’ virtual disks. Also, the management network is expected to have link capacity of 10000 (1000 is not supported due to excessive data-sync time). Use ‘fm alarm-list’ to confirm status. You can add up to four compute nodes to the All-in-One Duplex deployment. See also: ‘system help host-update’. Unless it is known that the host’s configuration can support the installation of more than one node, it is recommended that the installation and configuration of each node be serialized. For example, if the virtual disks for the entire cluster are hosted on the host’s root disk and that disk happens to be a single rotational type hard disk, then the host cannot reliably support parallel node installation. On controller-0, you can monitor the installation progress by periodically running the system host-show command for the host. Progress is shown in the install_state field. Wait while the host is installed, configured, and rebooted. Depending on hardware, it could take up to 20 minutes for this process to complete. When the reboot is complete, the host is reported as locked, disabled, and online. Wait while the compute node is rebooted and re-configured. Depending on hardware, it can take up to 10 minutes for the reboot to complete. Once the reboot is complete, the nodes availability state reports as “in-test” and is followed by unlocked/enabled. When all nodes are unlocked, enabled, and available: check ‘fm alarm-list’ for issues. Your StarlingX deployment is now up and running with 2x HA controllers with Cinder storage and all OpenStack services up and running. You can now proceed with standard OpenStack APIs, CLIs and/or Horizon to load Glance images, configure Nova Flavors, configure Neutron networks and launch Nova virtual machines. A single physical node that provides a controller function, compute function, and storage function. A node that runs cloud control function for managing cloud resources. Runs cloud control functions for managing cloud resources. Runs all OpenStack control functions (e.g. managing images, virtual volumes, virtual network, and virtual machines). Can be part of a two-node HA control node cluster for running control functions either active/active or active/standby. A node that hosts applications in virtual machines using compute resources such as CPU, memory, and disk. Runs virtual switch for realizing virtual networks. Provides L3 routing and NET services. The network on which all external StarlingX platform APIs are exposed, (i.e. REST APIs, Horizon web server, SSH, and SNMP), typically 1GE. Only controller type nodes are required to be connected to the OAM network. Internal OpenStack / StarlingX monitoring and control. VM I/O access to a storage cluster. All nodes are required to be connected to the management network. Networks on which the OpenStack / Neutron provider networks are realized and become the VM tenant networks. Only compute type and all-in-one type nodes are required to be connected to the data network(s); these node types require one or more interface(s) on the data network(s). 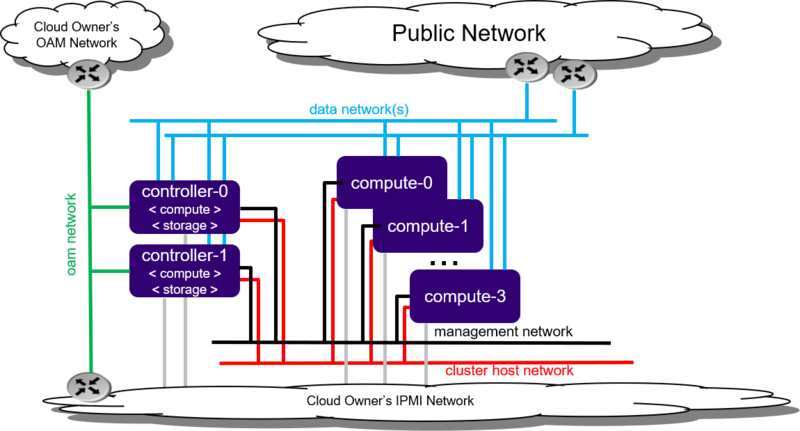 An optional network on which IPMI interfaces of all nodes are connected. The network must be reachable using L3/IP from the controller’s OAM interfaces. You can optionally connect all node types to the IPMI network. An optional network for controllers to boot/install other nodes over the network. By default, controllers use the management network for boot/install of other nodes in the openstack cloud. If this optional network is used, all node types are required to be connected to the PXEBoot network. IPv6 does not support PXEBoot. Therefore, IPv4 PXEBoot network must be configured. Most server’s BIOS do not support PXEBooting over tagged networks. Therefore, you must configure an untagged PXEBoot network. You must configure separate, per-region PXEBoot networks. A deprecated optional network that was historically used for access to the storage cluster. Untagged two-port LAG and optionally split between redudant L2 switches running vPC (Virtual Port-Channel), also known as multichassis EtherChannel (MEC). VLAN on either single-port ETH interface or two-port LAG interface.